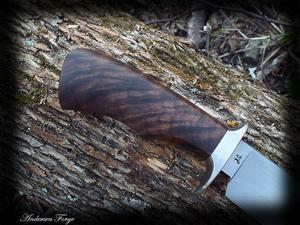 Everything came together quite nicely on this knife. 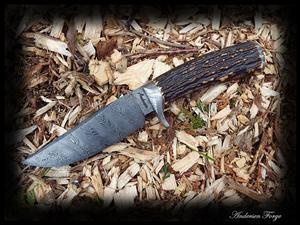 It's not very often I get to make a knife for myself - almost never - but when I get ready to make myself a new hunting knife, I will build one as closely to this one as I can! 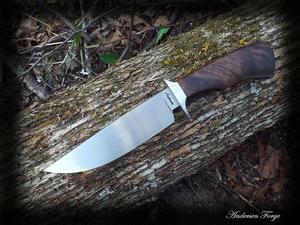 I used W1 tool steel for the blade and what you see displayed along the side is a natural hamon. 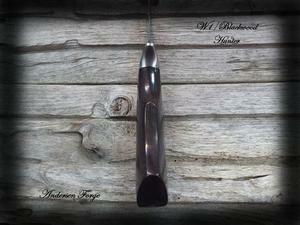 That is a differentially hardened blade resulting in two distinct hardening zones. 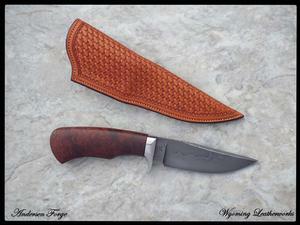 Some folks use refractory clay to achieve this, but this was done using heat alone. 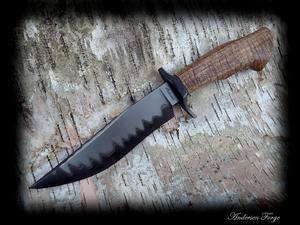 The African Blackwood is just off the map. Some folks always think of African BLACK wood as being black, but, the truth is, the high grades of African Blackwood contain random striations of varying tones of brown running through the material. 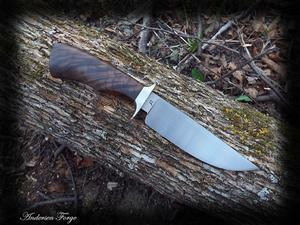 This knife was built in my traditional take-down method and I used stainless steel for the guard. 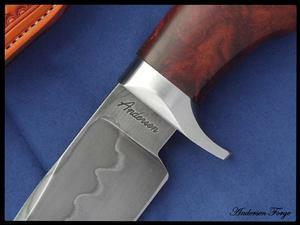 An Andersen Forge Hunter at its best. 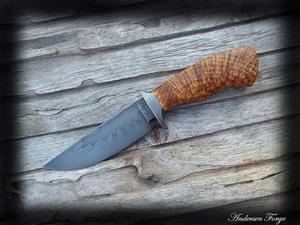 Another example of some fantastic African Blackwood. 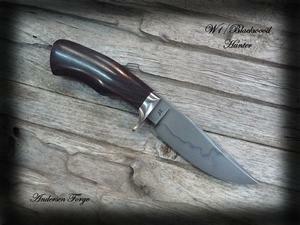 This is from the same block as the hunter pictured here. 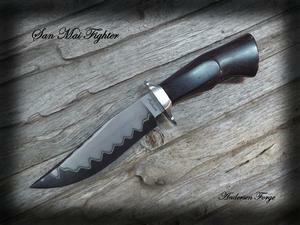 This Fighter blade was forged from 1095 tool steel and 420 stainless steel. My San Mai pretty much speaks for itself. The take-down assembly was created using stainless steel fittings. Thanks for taking your time to observe it. Just a real challenge to build, and a pure pleasure to complete. 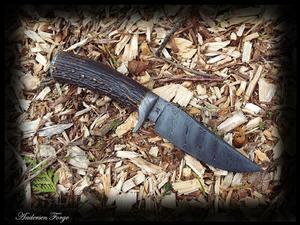 The Damascus blade was forged from a 216 layer billet of 1095 and 15N20 Single twist Damascus. 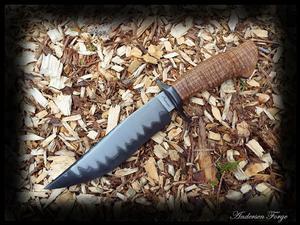 Then the blade was hot-blued. 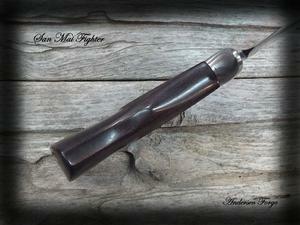 The fittings were made from wrought iron made in 1903 that I twisted and deeply etched. And then toss in there an exquisite piece of Sambar Stag and this is a spectacular package. A very lucky customer snagged this one. 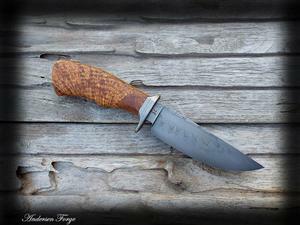 A perfect example of the type of quality you can expect in an Andersen Forge Hunter. Built in a full take-down assembly. 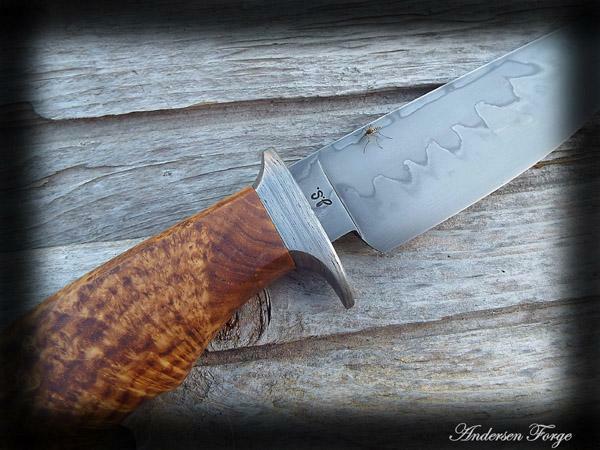 This is a W1 Andersen Forge Hunter with an exposed Hamon. A 416 stainless steel guard for corrosion resistance. 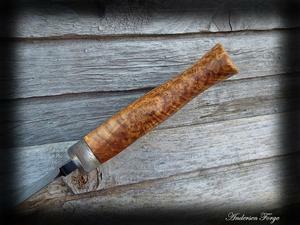 And a stabilized Amboyna Burl handle contoured to melt in a person's hand during any task. 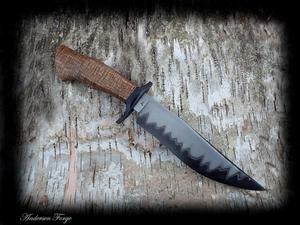 One of those "do-all" type knives I like to carry when I camp. 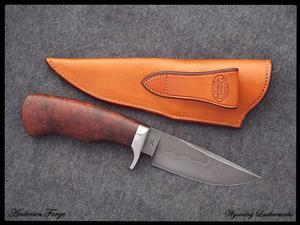 I forged this blade from a 1 1/8" round bar of Cru-Forge V. That one-time mill run of the only steel ever manufactured specifically for the forging knife maker. The added Vanadium creates some carbides adding amazing toughness. 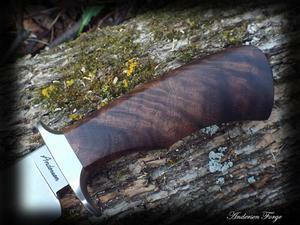 If you can find a nicer piece of walnut anywhere - I want to know about it!! 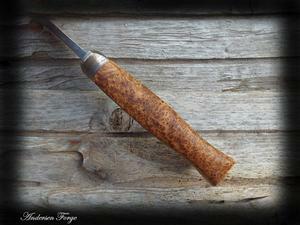 This is a piece of stabilized Franquette Walnut I got from a retired logger in Northern California. 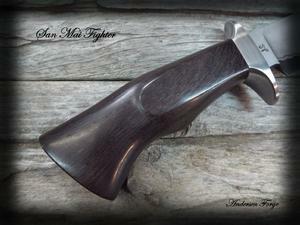 The 416 stainless guard is part of a full take-down assembly. 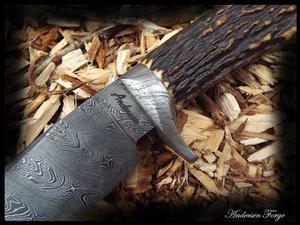 I forged the re-curved fighter blade from a billet of 1095 and 420 stainless steel San Mai. 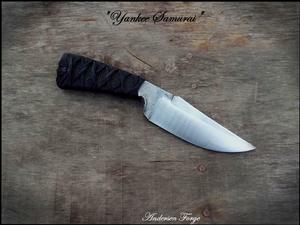 The unique undulations at the bottom edge of my San Mai are a result of the drawing dies on my press. 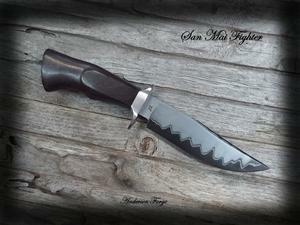 The Hi-Lo guard is hot-blued mild steel. Built it full take-down assembly fashion. 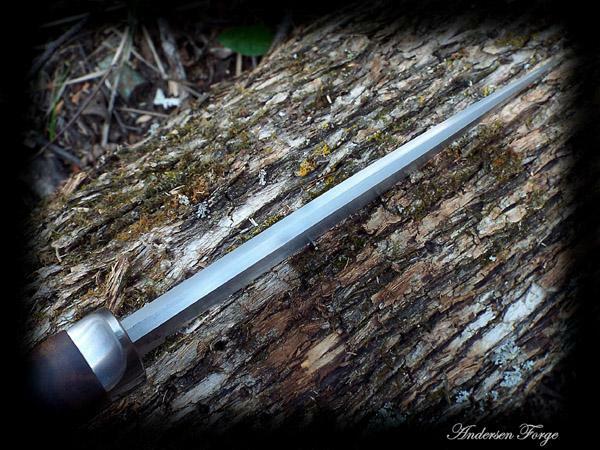 Should come handy in any alley fight in Tokyo. My neighbor down the road, here in Minnesota, build guitars, and some are built from the material he finds right on his own land. 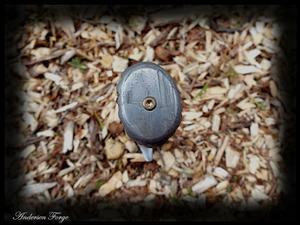 He had a small stash of Maple Burl chunks and gave one to me right after I moved here 2 years ago. I had the pieces stabilized and they are extraordinary. 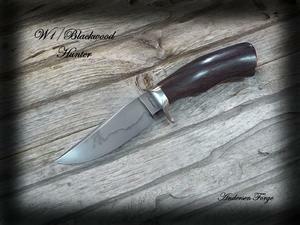 This is a W2 Pack Knife. Capable of handing jobs both big and small! 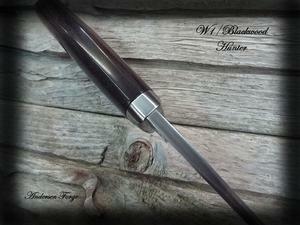 The guard is wrought iron made in 1903. Yet, on this one, I added a new dimension! I did a nine layer stack with four layers of 15N20 to break up the wrought iron striations. All this in a full take-down assembly. OK - let me have a little fun - alright? 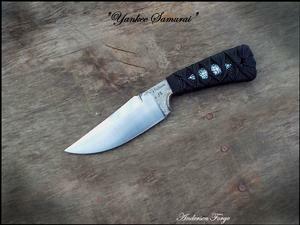 This is a W2 Brute de Forge with a cord wrapped "Samurai" handle made by a Yankee. 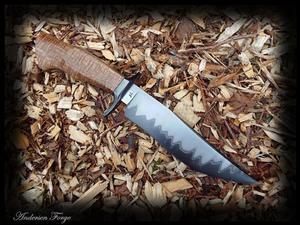 The main bevels were machine finished, yet, the hamon is pronounced just enough to be visible in the right light. 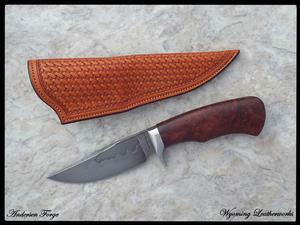 It went to a great customer who was looking for just this type of knife at the Atlanta Blade Show.